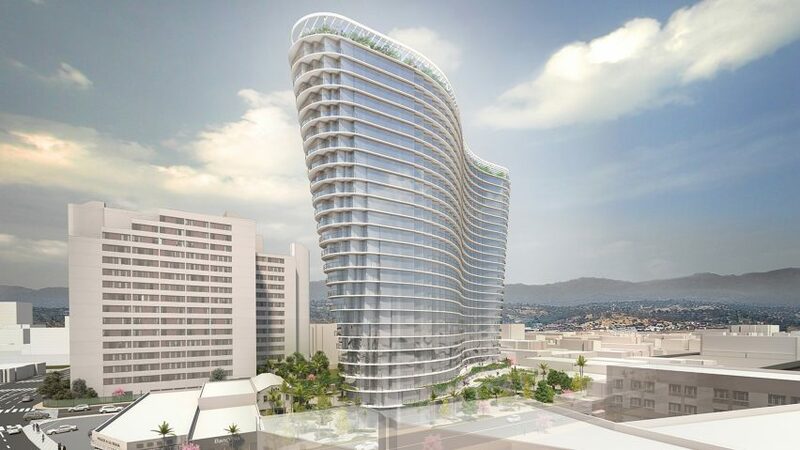 American firm Studio Gang has unveiled plans for a tower in Los Angeles with a curvy exterior evocative of a rolling wave. The tower is planned for 643 North Spring Street in Chinatown, and is the first LA project for the firm. Reaching 26 storeys, the series of floor plates are shaped to give the building its figure-eight footprint. Exteriors walls made from glass will curve diagonally across the floors. In front of the glazing, a collection of terraces will wrap around the building and provide views of the city and mountains. 643 North Spring Street is designed to link Chinatown and the recently opened LA State Historic Park to Union Station and the El Pueblo neighbourhood. "This project transforms a parking lot and commercial strip into an architecture that opens up the potential of the site to connect neighbourhoods," said Studio Gang founder Jeanne Gang. Public plazas are incorporated into the design with foliage and green pathways. They are planned to be along both Spring Street and New High Street. "Responding to the growing needs of the city, we designed the footprint to enable new generous outdoor public space at ground level while simultaneously creating a curved upper volume to capture views, light, and air for the building’s inhabitants," said Gang. The mixed-use tower has a narrow footprint and is planned to be approximately 55 feet (17 metres) wide, taking up most of the property. The LA project will include roughly 300 rental apartments, ranging from studios to three-bedroom apartments. All of the residences will share amenities with a 149-room hotel inside the building, including communal terraces on the second and third levels, along with a rooftop lounge. Retail spaces will occupy the ground floor, on the north and east sides, while underground parking is also planned. The mixed-use tower will be built in collaboration with a local development firm, Creative Space, as well as European brand MOB Hotel. "MOB Hotel's mission to encourage cooperative living, shared amenities include a gym, coworking spaces, rentable private offices, pop-up stores dedicated to young creators, a rooftop swimming pool and bar, and spaces for outdoor cooking and dining," said a statement. Studio Gang is an American architecture and urban design firm with offices in Chicago, New York, and San Francisco. Other projects designed by the studio include an angular glass tower near the High Line in New York City, as well as a high-rise for St Louis, Missouri with hundreds of cornered edges from its slanted exterior walls. Studio Gang also revealed plans for a 51-storey residential tower in Brooklyn with a rippled concrete exterior earlier this week.